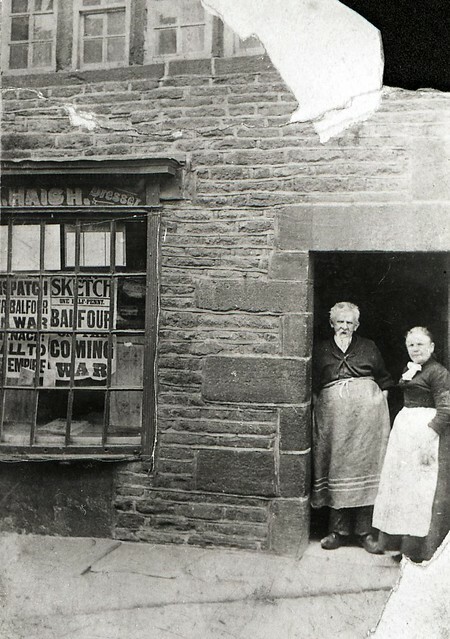 This well worn photograph of a family business from Delph shows headlines for the coming outbreak of war. The National Archives have published some tribunal reports from Middlesex today, telling the stories of those who appealed against conscription. Appeals could be made on a variety of grounds. We have papers from the Disley tribunals in the Greater Manchester County Record Office. Health issues, reserved or ‘starred’ occupations and family situations all feature in the appeals. There is also some guidance on appeals on religious grounds. Looking at the Disley papers you can see the importance of farming and horse breeding in the local community. There are also paper mills, textile mills and local coal mines. Paper was essential for disseminating information. Textiles were needed for equipment and uniforms. Coal didn’t just heat homes, but powered manufacturing and industry. Debbie Cameron, one of the GM1914 volunteers, has also uncovered a moving story of conscientious objectors, which will be shared on this blog in the next few weeks. David Langrish from The National Archives was on the Today programme this morning, discussing the appeals by businessmen, concerned that their businesses would fail. At GMCRO we have some bound copies produced for a local Literary and Educational Society during 1917 and 1918. In among the contributions are essays on enlistment administration, the role of the Special Constable and the difficulties facing one man businesses. We will be sharing extracts from these during the year to come, but with conscription and appeals in the news, I thought I would share an extract today. In Manchester, the City Council through one of their committees, called a meeting of the representatives of the various trade associations in the city and asked them to form a committee to look after the interests of those one man business proprietors who had already joined the army, or might have to do so in the future; such committee to sit as a Municipal Committee in the Town Hall with the assistance of Corporation officials as its clerks. The trade associations expressed their willingness to undertake the task; at once appointed their representatives, and commenced their duties. It was thought that in many cases they would be called upon to actually carry on the businesses of the men called up, and with that idea an elaborate scheme was formulated, but speedily found not necessary, for in no single instance was the committee asked to actually carry on the business, as the proprietors were always able to leave the business in the hands of some member of their family or preferred to sell it for the best they could get, but in spite of this the committee has for more then 12 months carried on a very useful work in various ways. Often a man has had his calling up papers suspended until he has been able to make arrangements either for the carrying on or selling of his business; sometimes the committee have procured leave for a man so that he might be able to straighten out matters that had accumulated or gone wrong in his absence, and in a good number of cases the committee have been able to procure the discharge of a low grade man from the army, as he was found of more use to the nation in attending to his own business than in washing floors or pots in an army hut.